2012年，美國電影藝術與科學學院的會員人數達到5783名。截至2012年 (2012-Missing required parameter 1=month!)[update]. ^ Pond, Steve. AMPAS Drops '85th Academy Awards' - Now It's Just 'The Oscars'. The Wrap. 2013-02-19 [2013-02-22]. ^ About the Academy Awards. Academy of Motion Picture Arts and Sciences. [2007-04-13]. （原始内容存档于2007-04-07）. ^ 4.0 4.1 謝宇程. 奧斯卡的那些「小獎項」，其實是電影產業的大關鍵. 鳴人堂. 聯合新聞網. [2017-03-03] （中文（台灣）‎）. ^ "Oscar" in The Oxford English Dictionary, June 2008 Draft Revision. ^ Bette Davis biography. The Internet Movie Database. [2007-04-13]. （原始内容存档于8 March 2007）. ^ Sandy Cohen. Academy Sets Oscars Contingency Plan. AOL News. 2008-01-30 [2008-03-19]. （原始内容存档于2009-02-03）. ^ Jackie Finlay. The men who are counting on Oscar. BBC News. 2006-03-03 [2007-04-13]. （原始内容存档于19 March 2007）. ^ Academy Invites 115 to Become Members. Academy of Motion Picture Arts and Sciences. [2007-09-04]. （原始内容存档于2007-08-27）. ^ Horn, John. Unmasking the Academy. The Los Angeles Times. 2012-02-19 [2013-10-15]. （原始内容存档于2014-03-07）. ^ Cieply, Michael. Electronic Voting Comes to The Oscars (Finally). The New York Times. 2011-05-23. （原始内容存档于2014-01-05）. ^ Rule Two: Eligibility. Academy of Motion Picture Arts and Sciences. [2007-04-13]. （原始内容存档于2013-11-10）. ^ Oscars Submission FAQ. [2015-03-16]. ^ The Academy and its Oscar Awards – Reminder List of Eligible Releases. （原始内容存档于2013-11-11）. 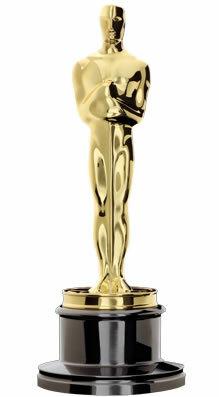 ^ Academy Award Rules (PDF). [2015-03-17]. ^ 17.0 17.1 Pond, Steve. Eight things every voter (and fan) should know about Oscar’s decidedly unique nomination process.. Los Angeles Times. 2006-01-07 [2007-01-27]. （原始内容存档于2006-10-17）. ^ Young, John. Oscars: The wacky way the Academy counts votes, and the results of our 'If You Were an Oscar Voter' poll. Entertainment Weekly. 2011-01-27 [2016-02-29]. ^ 19.0 19.1 19.2 Preferential Voting Extended to Best Picture on Final Ballot for 2009 Oscars. Academy of Motion Picture Arts and Sciences (新闻稿). 2009-08-31 [2016-02-29]. （原始内容存档于2009-10-10）. ^ VanDerWerff, Todd on. The Oscars’ messed-up voting process, explained. Vox. 2015-02-22 [2016-02-29]. ^ Marich, Robert. Marketing to Moviegoers: A Handbook of Strategies and Tactics 3rd. Southern Illinois University Press. 2013: 235–48. ^ History of the Academy Awards. Academy of Motion Picture Arts and Sciences.